Who doesn't love a good candy shop? Whether you want to explore the amazing treats you might find at the local chocolate factory store or sample delights from around the world, Nevada has some of the most unique candy experiences around. 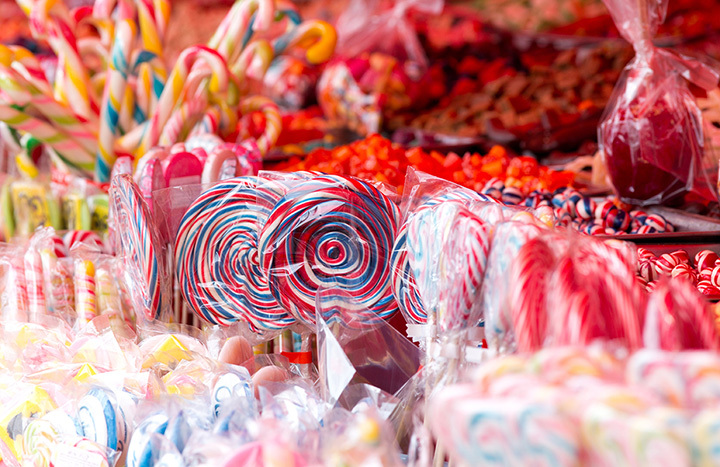 Relive those long lost adventures of being a kid in a candy shop or give your own little ones their first taste of the yummy goodness at one of our top 10 picks for candy shops across the state. For your own adventure to rival the likes of any Willy Wonka trip, take a tour at this one of a kind store and factory. You may gain a new admiration for the work that goes into making the chocolates and we know you will of course gets some pretty amazing samples. The Cactus Garden is a nice place to explore as you snack on your purchase. Known for their small batches and attention to detail, these amazing treats are worthy of any special occasion. They are also yummy enough that you might just find yourself sneaking away for a treat. Well known for their ever changing holiday menus, they also keep the locals coming back for their fudge. If you are a fan of everything Hershey's, this is a must see spot on your next trip to Vegas. With 13,000 square-feet of display space, you can find just about any of their products here. You will also enjoy some more creative uses of the candies like the huge 800-pound solid chocolate Statue of Liberty. This small business does candy in a big way. Once you visit and see their hands-on approach to making candy, you may just find yourself ordering from them on a regular basis. The recipes are made with the best ingredients and offer quality that is hard to match. Hand-dipped candies at their best! This is one of the best places to get fresh, and amazingly smooth chocolates. The flavors are amazing and the time spent watching the candies being made only adds to the excitement. Rocket Fizz is the place to go for all those retro candies you crave. They also offer a cool assortment of unusual soda pops as well including things like s'mores flavored bubbly and many other flavors you won't find anywhere else. This place knows their chocolate. They have tastings from all over the world and offer the biggest variety of chocolates sourced worldwide. It is an adult adventure to explore one of the tasting classes. Beyond the candies, their ice cream is also pretty amazing. This is a classic take on the candy shop with a special nod to the small business side of small-batch sweets. The tours are pretty neat and the candies will take you back to that small town feel. Locals enjoy their monthly specials and changing items. Chocolate is an art form in this candy shop that is all grown up. These are the types of candies that score major points for a true chocolate fan. Their creative team is quite well known for the innovative approach to candy making. The ambiance of this old-fashioned candy shop just adds to the sweet-searching experience. You literally step back in time the moment you walk through the door. The candy is just like you remember from childhood and the staff is as friendly as can be.